The hero passenger who helped restrain a disruptive JetBlue captain that caused the jetliner to be diverted to Texas said today that he knew controlling the man could be the difference between life and death for a lot of people. "I knew there were about 130 people on the plane...families, kids...and I thought, this is not going to happen on my plane," passenger David Gonzalez told ABCNews.com. The unruly captain has been identified as Clayton Osbon to ABC News. His wife, Connye Osbon, was clearly distraught when contacted by ABCNews.com. "There are several different sides to every story. Just keep that in mind," she cautioned. But she added, "I don't have a clue... I have no idea what's going on." "I haven't spoken with him," Mrs. Osbon said. Gonzalez, 50, was sitting in the second row of JetBlue Flight 191 when the he saw the captain storm out of the cockpit and rush toward an occupied bathroom. The co-pilot quickly locked him out of the cockpit. After being locked out of the cockpit, the captain began banging on the door, demanding to be let back in. "We got to get this plane down," Gonzalez remembered thinking. "This guy is nuts." Flight attendants struggled to control him and Gonzalez said the captain began moving in the direction of the plane's emergency exit. "I just didn't want him opening up that door," Gonzalez said. "I knew if he got in there, we wouldn't be sitting here now." Gonzalez went to help the flight attendant and asked the captain what his problem was. Gonzalez said the unruly pilot replied, "You'd better start praying right now" and was shouting about Iraq and Iran. "I said, 'I'm going to show you Iraq and Iran right now,' and I just took him in a choke hold," Gonzalez said. "I started to cut his windpipe off so he couldn't get any air." Gonzalez felt the man get weak and he passed out about three minutes later. Gonzalez and the group of men helping him restrain the pilot with seatbelts and offered him some water when he came to. "If he got a second wind, I'd have to apply more pressure and I didn't want to hurt him," Gonzalez said. 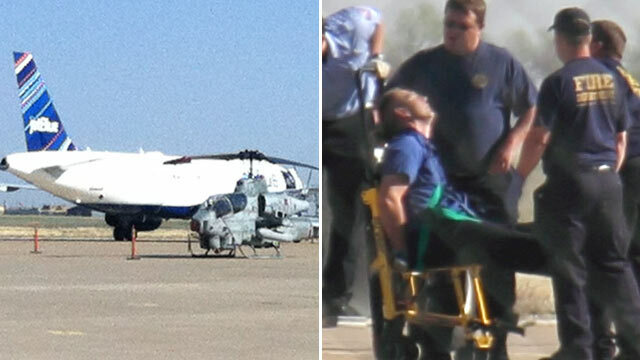 "I just wanted to get him calm, get the plane down and get him some medical assistance." Gonzalez, who lives in the Poconos area of Pennsylvania and is a married father of five children, said he used to work for the New York City Department of Corrections and now works for a security and surveillance company. He was on his way to Las Vegas for an annual security show. Gonzalez remained on top of the captain until the plane landed, afraid of what might happen if he got free. He said it "looked like a TV SWAT show" when the plane landed, with police swarming the plane. On the ground, passengers thanked him and asked to take photos with him, hailing him a hero. "It's amazing how people thanked me," Gonzalez said. "I don't find myself a hero. I just couldn't take that. I got that spark. I knew I had to get involved." Another passenger sitting close to the front of the plane told ABC News that the captain walked out of the cockpit and went to the bathroom before the incident happened. "The guy was in the bathroom for a while and the pilot inside the cockpit locked the flight door," the passenger said. "Passengers noticed the guy acting weird when he came out of the bathroom." The unruly pilot then went to the cockpit and started pounding on the door. The passenger heard someone yelling "bomb" and "we're going down." The passenger believes it was the locked-out pilot who was shouting. A co-pilot remained in the cockpit and was flying the plane, designated as Flight 191, which was carrying 135 passengers and six crew members. The passenger said it was a "crazy scene" that ended when a group of male passengers restrained the disorderly pilot at the front of the plane until it was able to land. A government source told ABC News that an off-duty JetBlue pilot who was traveling on the flight helped land the plane in Texas. "At roughly 10 a.m. CT/11 a.m. ET, the pilot in command elected to divert to Amarillo, Texas, for a medical situation involving the captain," JetBlue said in a statement. "Another captain, traveling off duty, entered the flight deck prior to landing at Amarillo, and took over the duties of the ill crewmember once on the ground," the statement said. "The aircraft arrived Amarillo at 10:11 am CT, and the crewmember was removed from the aircraft and taken to a local medical facility." The captain is now in FBI custody. Today's commotion was the latest sky-high incident to interrupt a flight. On March 9, an American Airlines flight headed from Dallas-Fort Worth to Chicago returned to the gate just prior to take off when a female flight attendant began making inflammatory remarks over the public address system. Passengers intervened and restrained the flight attendant before Dallas airport police boarded the flight.